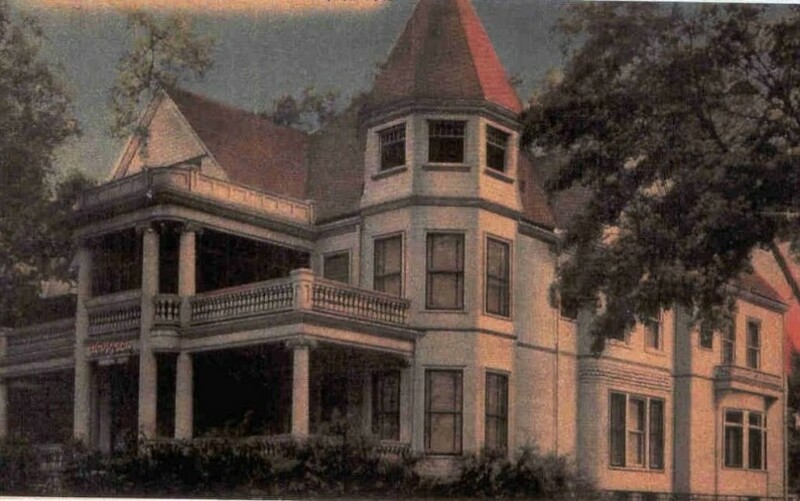 The postcard identifies this large familiar home as the Hodgson Funeral Home. That name tells us the card was published after 1941, when the Hodgson Mortuary moved from 17th Street to 608 20th Street and changed its name to Hodgson Funeral Home. Hodgson owners Alwin F. Lindoerfer and Walter Hesemen had announced the previous year that, pending permission from the City Council, they would purchase the DeSilva home for a funeral home. They intended to make extensive renovations, and noted that forty years previous it was considered a showplace of Rock Island. The Argus described it as being one of Rock Island’s most palatial residences. The first owner of this 14-room house mansion, which was built about 1892, was Henry B. Sudlow. Mr. Sudlow was a Superintendent of the Rock Island & Peoria Railroad as well as a Superintendent of the Coal Valley Mining Company. He was also a director of the railroad. His wife, Mary, may have been a member of the railroad-owning Cable family. In the late 1890s, Mrs. Sudlow hosted 200 people in this home at a reception to welcome Mrs. H. S. Cable into Tri-City society. When the Sudlows sold the home to Dr. Joseph DeSilva around 1901, they moved to a smaller home at 832 23rd Street. Until selling to Hodgsons, Dr. DeSilva lived in the home with his son, Edward, who was also a prominent physician. At that time, Dr. DeSilva, who was about 70 years old, had practiced in Rock Island for 45 years. After this house was sold, Dr. DeSilva said that he would move to the Harper House hotel downtown, which he had purchased from the Harpers in 1909. The first known photo of the house appeared in Picturesque Tri-Cities, published shortly after the DeSilva family purchased it. That photo depicts a house that looks like the one on our postcard, but without the two-story front porch. The octagonal tower, which showed retracted fabric awnings on its windows, and the intricate roofline define the home as Queen Anne in style, while the extensive use of plain wood shingles at the third floor level are characteristics of the Shingle style. The varying shades of gray in the vintage black and white photo indicate a multicolor paint scheme, very appropriate to the Queen Anne style. On the stone curb next to the street, Dr DeSilva had placed a large stone block with his name carved in bold square letters – a stepping stone to help enter high carriages. So who added the big front porch on the postcard? Evidence points to the DeSilvas, since old fire insurance maps show the porch appeared about 1930. At the same time, a large addition was made at the northwest corner of the home – far right on our postcard. A one-story porch on the south that appeared in the early photo was removed. The intent of this remodeling – in addition to creating more space — almost certainly was to “modernize” the house from a Victorian Queen Anne to a Classical Revival, a style repopularized in the 1920s. The postcard depicts the house as white, with a darker trim strip between stories as well as horizontal colored stripes on the porch balusters. The coloration may be an artist’s enhancement of the original photo. The awnings are gone, but the tower windows are all fitted with forties style wide slatted Venetian blinds with wide tape hangers. There are more differences between the home on our postcard and the one today. Now there’s a two-story porte-cochere addition on the south where the small porch was once located. Since this addition appears in a photo taken in 1941, it is probably one of the extensive renovations planned by Hodgsons in 1940. The first story on the front porch has been enclosed and, around 1980, aluminum siding was installed on the exterior, except for the gables, where original shingles remain. The interesting rounded bay on the north side that shows on the postcard has been covered with a vertical siding, but it is still curved. The balustrade atop the porch roof has also been removed. One hundred and ten years old and only three “families” — not bad for this old house! This article, by Diane Oestreich, is slightly modified from the original which appeared in the Rock Island Argus and Moline Dispatch on November 11, 2001.